Baby (Ansel Elgort) is a natural behind the wheel. Few can compete with him. As a result of an accident when he was young, he always has headphones in with music pumping to drown out the noise. He works for Doc (Kevin Spacey) due to a poor choice he made. Doc arranges heists using various thugs with Baby as the getaway driver. As the heists get messier, particularly when Bats (Jamie Foxx) is involved, Baby gets more anxious to have his debt repaid and be out of his obligation. When Baby finally pays off Doc, he plans to get in his car and drive away with Debora (Lily James), a waitress he met in a diner. Doc has other plans. Threatening Baby and Joseph (CJ Jones), his adoptive father, and anyone else he cares about, Doc convinces Baby to drive on the biggest heist yet. As Bats and two of Doc’s other cohorts, Buddy (Jon Hamm) and Darling (Eiza González), prepare for the job, Baby is looking to get out. When things don’t go as planned, everything takes a turn for the worst. Baby Driver calls back to the days when car chases were a movie staple and does so magnificently. Without the campiness and outrageousness of the Fast and Furious franchise and the hideousness of the mess of Getaway, writer/director Edgar Wright shows that, done properly, you can make a movie centered around driving that is a thing of beauty. Without much experience under his belt, I have always been on the fence about Ansel Elgort. He was fine in the parts he had, but nothing special. This film changed that for me. Elgort doesn’t say much in the film, a topic that is brought up several times in the movie. This makes his performance that much better. He glides through the world to the beat of whatever playlist he has going at any time. He carefully crafts each playlist, many times using recordings of people and things around him to create songs to go along with whichever playlist fits the moment. As the criminal mastermind, Kevin Spacey suits the role well. His manipulative ruthlessness shines through in true Spacey style. Jon Hamm easily switches from laid back to unhinged with ease. Playing the cold, less than controlled Bats, Jamie Foxx isn’t bad either. Lily James brings a certain innocence and charm to the naive waitress falling for Baby. Visually, the film is a treat. 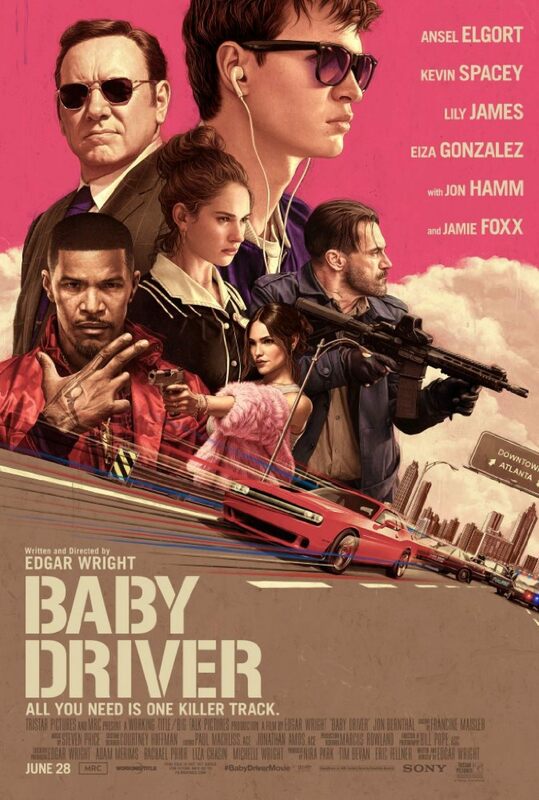 From beautifully choreographed chase scenes, to full on action, to intimate moments between Baby, Debora, Joseph, and Baby’s parents, Edgar Wright sews everything together perfectly. Everything is scored to an amazing soundtrack that not only fits each moment, but is synced to the real world even in the most subtle ways. I would be surprised if Baby Driver isn’t mentioned come awards season. Many of this summer’s blockbusters have been underwhelming, leaving a lot to be desired. Edgar Wright blows almost all of them away with this masterpiece. I suggest seeing it at least once in the theater to fully appreciate the beauty of Baby Driver. I cannot recommend this film enough, it is one of the best films of the year.